We’re incredibly excited to announce Mike Majkowski’s return to Astral Spirits, after his brilliant “Neighbouring Objects” tape that came out in 2015! 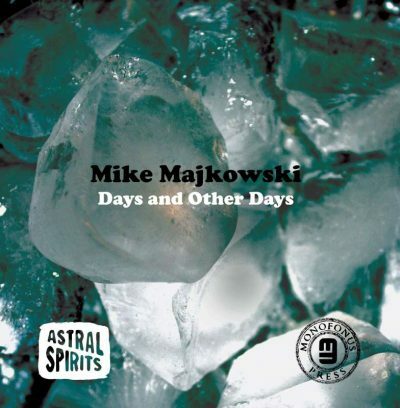 “Days and Other Days’ is Majkowski’s 7th proper solo release following on the heels of the equally magnificent releases “Bright Astonishment of the Night” on Bocian Records and “Swimming in Light” on Entr’acte Records. Quite possibly the most astounding and darkest (in a good way) album we’ve heard from Majkowski yet! He continues to explore the intersection between acoustic instruments and electronic sounds. Diving deeper into repetitive structures and their mutations, as well as resonant frequencies of acoustic instruments. Majkowski builds off the foundational aspects he’s explored in previous releases but “Days and Other Days” strips off some of the excess and pares things down even further. It becomes almost impossible to tell what instruments are being played and is just about the sounds. Think Jon Gibson meets the Necks meets Lawrence English. A truly stunning work. Mike Majkowski “Days and Other Days” is out May 26, 2017 in an edition of 300 LP’s with digital download. Mike Majkowski — Double bass, analog synthesizer, percussion, piano, vibraphone, samples & field recordings. Recorded, constructed & mixed by Mike Majkowski. Berlin, February – June 2016.
Review by MATTHEW SWEENEY for DECODER MAG. Review by EYAL HAREUVENI for FREE JAZZ BLOG. Review by TRISTAN BATH for THE WIRE. Review by GRANT PURDUM for TINY MIX TAPES. Review by BARTOSZ NOWICKI for RAZ UCHEM/RAZ OKIEM (in POLISH). Review by BOB BAKER FISH for CYCLIC DEFROST. Review by JOSEPH O’CONNOR for LOUD MOUTH. Review by RYAN MASTELLER for CRITICAL MASSES.